Friends, colleagues, students and fellow students; art lovers, visual artists aspirants, good morning. It is a pleasure for me to join you this morning as you open yet another exhibition of BTech Students. Your institution leaps forward once more and with that leap it offers us what in the past four years it has been concocting as far as training of artists both technically and theoretically is concerned. 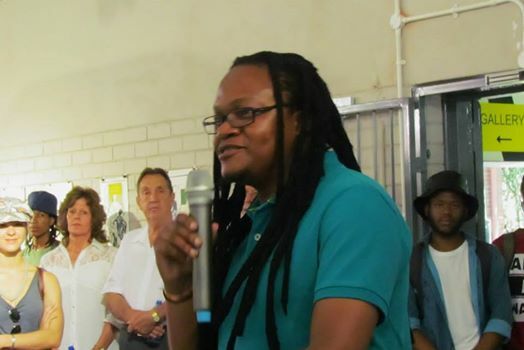 About a couple of months ago when I was approached by Runette Kruger, Head of Department, on behalf of your institution to open the exhibition of BTech students I seized the opportunity without thinking twice but afterwards I was to spent the successive days leading to today wondering if it was a good idea or whether I had done myself a disservice by allowing myself to be bombarded by an array of artworks each clawing for attention. I must confess that the situation did not improve one bit when I requested to have a sneak preview of the exhibition on 5 February. I left the gallery worried and at the edge of hysteria than I was when I arrived earlier on. For what does one say when one opens an exhibition that can make or break an artist? This exhibition which consists of 14 artists is pivotal as far as what lies ahead in the careers of these artists is concerned. At this level the artist should be proficient with the medium of their choice. They should be adept in their thinking of concepts and imaginative in the physical expression or manifestation of those very concept or ideas into visual art objects. I believe that what we see here is the highest level that the artists have attained in their academic development following their time in this academic institution. However I stand corrected as it is the artists themselves who knows deep down whether they have given their all. How does an artist know that they have given their all? Or do indulge my theatrics just this once and allow me to say – it is the artist who knows deep down whether what they are saying through their work is honest enough as far as content is concerned; It is the artist who knows with what media are they proficient and lastly it is the artist who is best suited to identify and zero in, occupy the zone of those most salient themes, issues or topics that preoccupies them. At the level of Btech the artist should have the freedom; the artists should be given the freedom to tackle issues that concerns them, that way the artist approaches a level wherein their art is a reflection of exactly what they would like to contribute to the visual art industry: A world wherein competition is so fierce that only those who are industrious, focused and resilient emerge victorious and live off their art. Those who make it are the exceptional ones. However the rung which must be climbed is a similar rung. Thus those who struggle can continue to wobble until they too reach the highest rung. They have to try harder if art means anything to them. The work on show consists of drawings, paintings, printmaking, digital prints, ceramics, sculpture as well as installations. These are easily identifiable as the viewer browses through the exhibition. Beneath this surface level there is a myriad of themes ranging from feminism, fertility, self portrait, decomposition, family, religion and culture expressed either in two dimensional, sculpture and installation. The body of work on show might be hindered here and there by work which appears to be unfinished, but those very works are balanced off by the technical brilliance inherent in the stronger works. the work in question, the stronger work that is, do not even need artists’ statements in order for them to hold their own ground in the discourse of a search for the next manifestation of the visual art object. When I first looked at the work I was awed by the attention to detail that has been considered by the artists as far as execution and presentation is concerned; this can be seen mostly in the ceramics, I refer here to the work of Calvin Mosekare and Michele Le Grange. This technical proficiency in the medium used for the creation of the work of these artists is carried over in the sculptural outings and almost near abstraction drawings of Reynard Coleman who has delved in the traditional ‘Shangaan’ wood carvings technique to remind us of a great tradition of the master apprentice relationship that pervades art training as well as appreciation of indigenous art. His sculptures are thought provoking. Impressive also are the conceptually pregnant works of John Robertse, Retha Nemann and Keshia Milne whose works are preoccupied with personal interrogation and self reflexivity. The remaining works of Tatiana Kelm (Paitning), Tumelo Malatji (Printmaking), Jessica Mashiane (Digital Print and Video Installation), Kulani Rocco Mthombeni (Glass), Kalyca Sassman (Painting and Digital print slide), Zanele Mthembu (Mixed Media: Wirework and Fabric Installation), Maryna Pretorius (Drawings and Printmaking) as well as Mashudu Nevhutalu (Prints and Paintings) are of equal significance in this exhibition. In totality the exhibition on show is brilliant, it is the benchmark of what this institution is about; art at its technical application. I will like to congratulate both Cathy Batchelliere and Leanne Olivier for bringing together this work into a coherent exhibition through their curatorial work. From here onwards the artists can only continue to scale the heights in the great exodus to redefine the evolving nature of the visual art object; we the art consuming public can offer them nothing in return but attention where it is due as you challenge us conceptually through work that exhibits an undying commitment to the dynamism between ideas (content/concept), Technique (drawing, painting, printmaking etc.) and medium (pencil, water colour, wood etc).